Last week my son was asking me about what flowers I love. “Tulips, Daffodils..” I told him “but I really like hydrangeas too.” Being five and me having somehow missed this vital bit of parenting he didn’t have a clue what a hydrangea was so I tried to explain them to him, the balls of tiny flowers all packed together in gorgeous pastel colours and then I thought, hey, rather than just explaining and showing a picture, why not try and make some too with this fun hydrangea craft for kids? 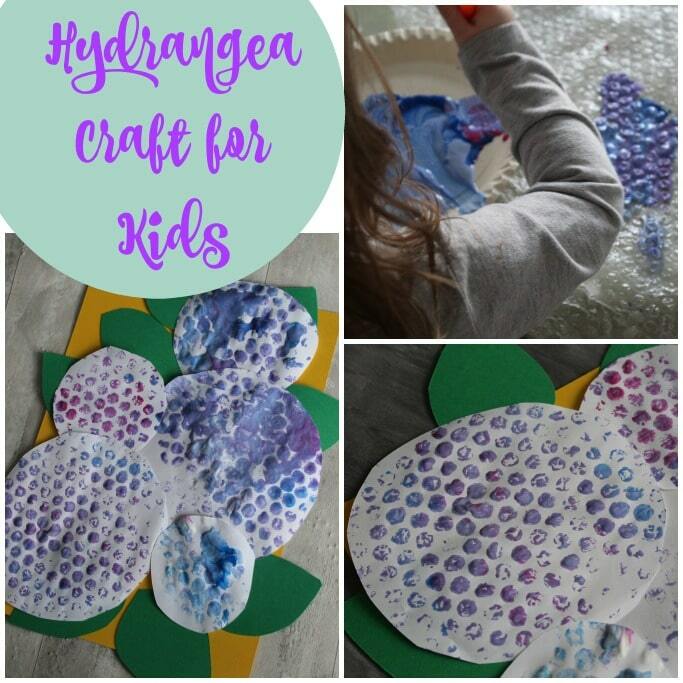 We love sharing crafts for toddlers as well as older kids so you’ll see how easy this was to create with my two year old too! I made this craft with my kids who are five and two, so before I started I got everything set out. My experience is my kids are more than happy to make stuff but they get less interested the longer they have to wait! I cut the white paper into circles and the green card into leaf shapes but obviously depending on the age of your kids and their desire to get the scissors out they might want to do this themselves. 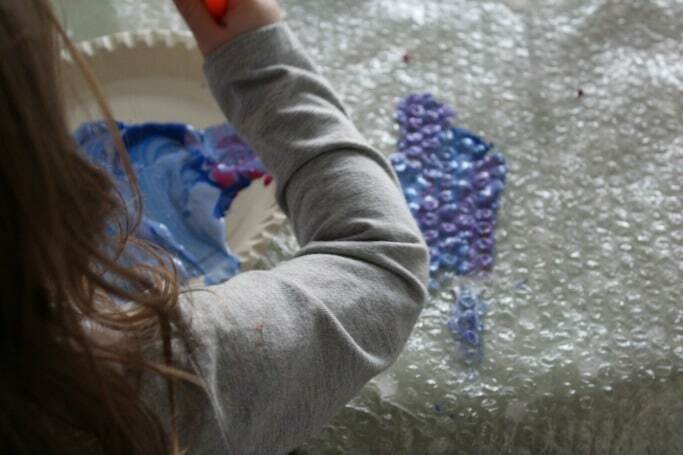 We squeezed the paints out onto paper plates (which makes for quick tidying later) and then using paintbrushes painted the bubblewrap. I could tell that my two year old really enjoyed this and while my son was happy just using a paintbrush to do this, she predictably ended up using her hands too. This is why I always keep babywipes to hand when we are using paints! 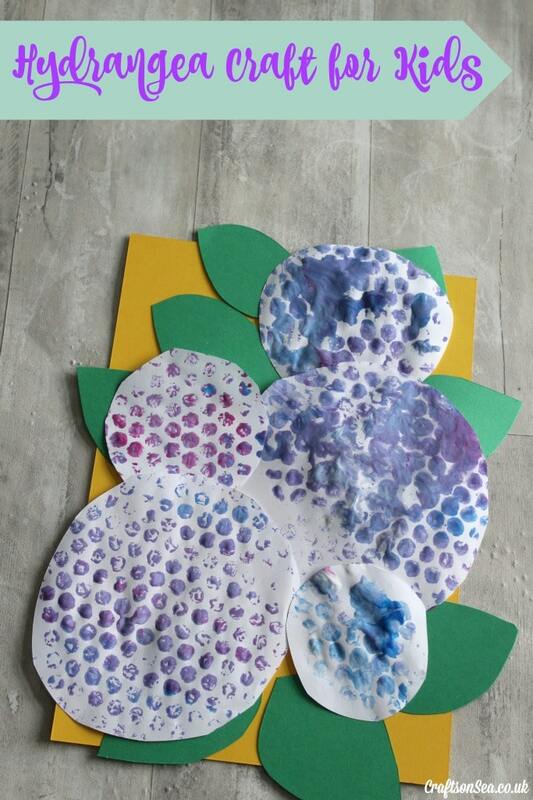 When you have painted the bubble wrap, place a circle of white paper on it, push down and then pick it back up again to get the coloured ‘flower’ print on the paper. If you want perfect circles then putting less paint on to your bubble wrap makes this easier to achieve, we did a mixture of both. Once you have made your hydrangeas you can arrange it with the green card leaves to make a hydrangea plant. This would also look really nice on a card, perhaps for Mother’s Day! Ah this is lovely. We love bubble wrap printing here. Will have to give it a try .